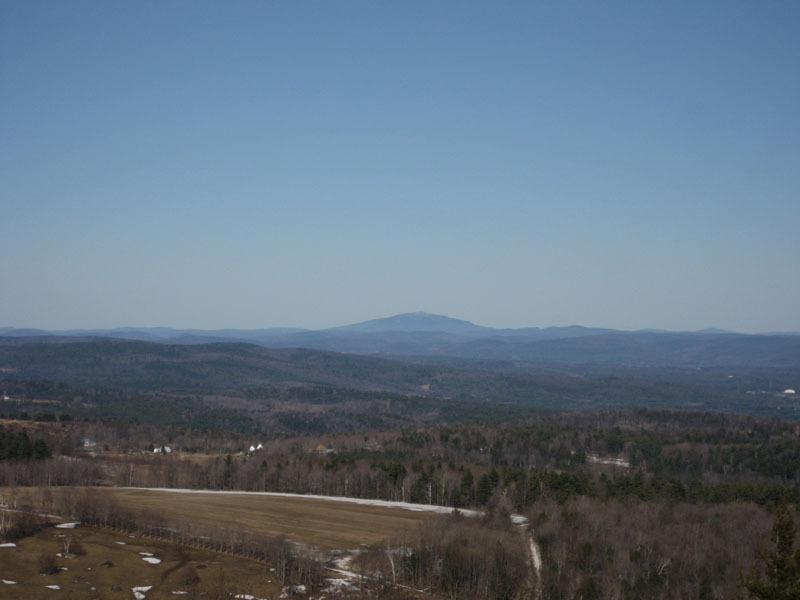 Though I had a craving to go skiing (not a cloud in the sky, mid 50s), I did the next best thing after work and hiked up Massaemett and over to High Ledge. Things have changed rather dramatically since my last hike up Massaemett - much of the snow has melted, leaving the trail a collection of mud, slush, and ice. 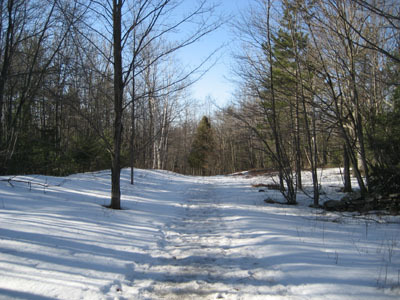 With the aid of Stabilicers, the trail was still passable. My guess is that in a day or two, it'll be barebootable. 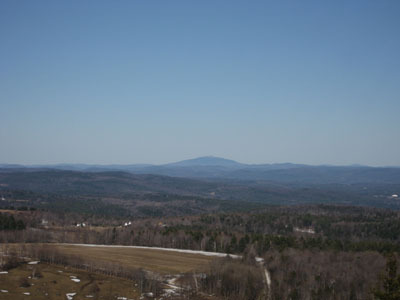 After reaching the summit and seeing excellent views from the firetower, I decided to continue down the ridge to the High Ledges. From there, the views to the west were still strong, though obviously not as great as the panoramic ones from the firetower. I have heard rumors for quite awhile about a trail from the High Ledges back to the high tension power lines. Not wanting to backtrack all the way back to the firetower, I decided to either find this trail or bushwack my way back. Deciding that it seemed like there was a trail on the south side of the cliff, I traversed my way off the High Ledges and onto the flat below them. Though obviously people had been down there, I couldn't see an obvious trail. From there, I cut southwest until I hit a deer trail and a brook. Finding a blowdown to cross over the brook, I continued to follow the deer trail due south (there was heavy brush and some moderate ledges in the western direction at this point) until I hit a second brook/gully. 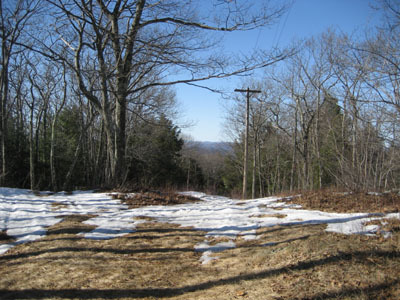 Here I noticed some sort of east-west snowshoe trail - I may check this out again some other day and see where it goes - my guess is from near the cemetary up to the communications towers between the High Ledges and the fire tower. 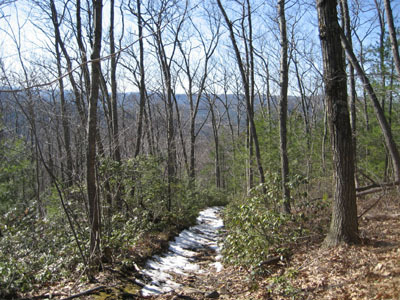 From here, the bushwack earned its name - heavy brush and mountain laurel. Just when I though I was out of it, I'd be at a cliff, forcing me back into more junk. 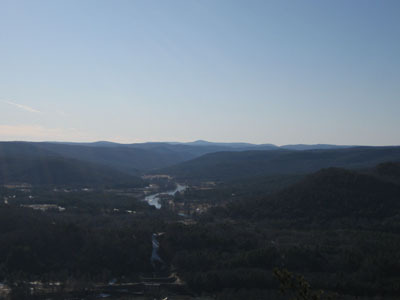 I decided my goal was to hit the intersection of the high tensions and the trail I take up to the firetower. Going without a map or compass, this would be a bit of a challenge. Eventually, after another brook crossing, I hit a northeast-southwest trail. Knowing I was near my destination, I decided to follow this trail just to see where it hits the main trail. If not for taking this detour, I would have made it to my goal within feet. Even with the detour, knowingly backtracking up the hill, I was within 500 feet of my destination - not too bad! Lessons learned? There's way too much brush and undergrowth at the elevation I traversed the mountain at. I may try to find this elusive trail from the High Ledges again someday, however at this point I'm more eager to see where that trail in the gully comes from/goes to. 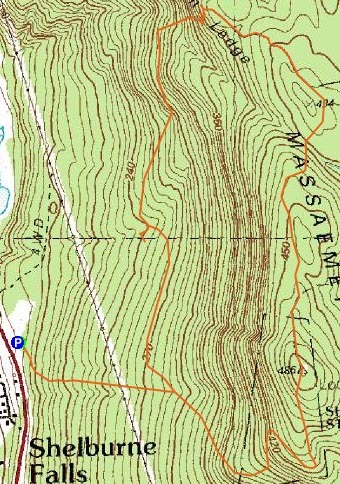 Directions to trailhead: Climbing a hill East on Route 2 after passing the 112 North exit, look for a small paved driveway on the left as the road levels out. This is not plowed in the winter. 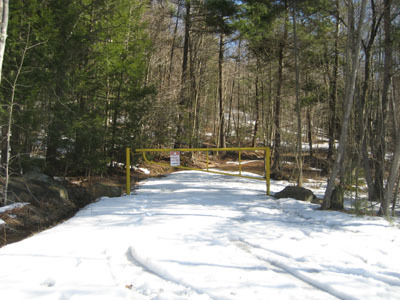 The trail starts at the yellow gate.